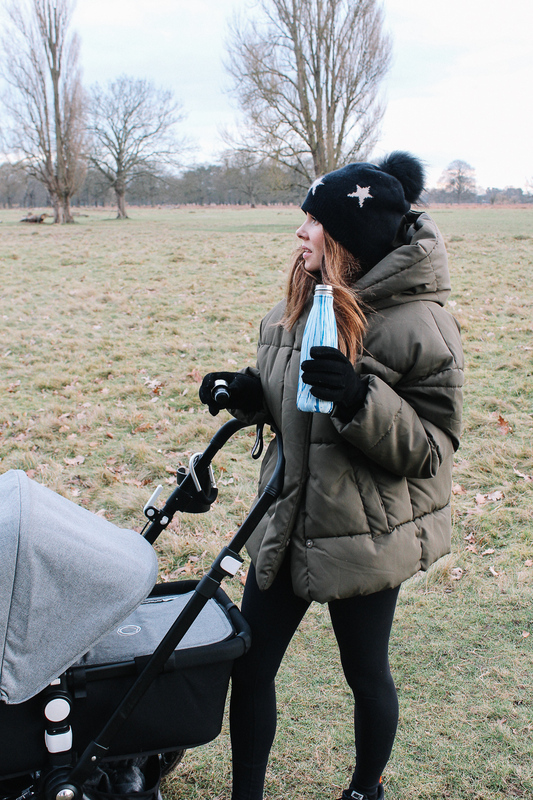 So firstly, the number one thing which I believe helped me shed the initial bit of the weight in the first month, was the breastfeeding, which really burns the calories (hence why I have been eating like a horse these past few months!). Obviously I am not going count that as any kind of workout example (as that was certainly not my reasoning for doing it), and of course there are many who choose not to breastfeed, or are unable too. But I just thought I would put it out there, as one of the initial reasons to why the weight quickly dropped off for me personally. 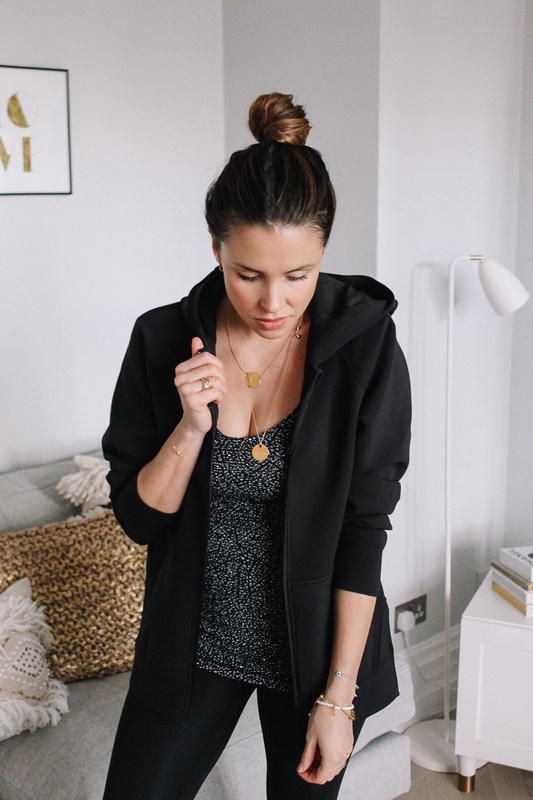 But it’s all very well loosing the excess weight, when there is no tone or muscle left whatsoever… I also had a pretty poor starting point, as I had basically quit working out pre pregnancy (in a bid to become pregnant), other than the occasional light yoga session. Throughout the pregnancy, I continued with pregnancy yoga, and did some light weights to maintain strength (for what was to come), but then the last few months when I was feeling extra heavy and sluggish, my appetite for working out dwindled away all together – so come post baby, my body was feeling super weak. Fortunately my urge to start working out, has come back in full force (which might have something to do with my impending holiday to Dubai next month!). 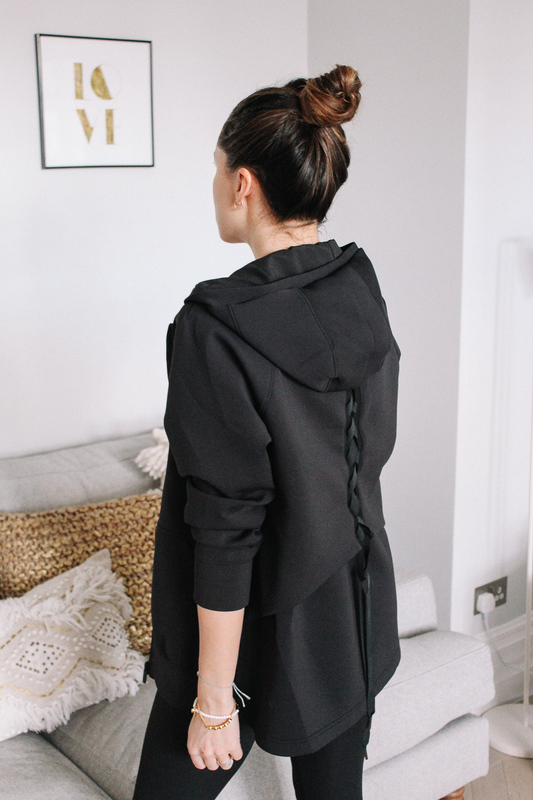 And since becoming a mummy; my reasoning is no longer because I want to be slim – it’s now all about strength and stamina, and some much needed toning… Here are 5 ways I have been getting back into shape! Since becoming a mummy, I have never walked this much in my life! My favourite part of the day, is taking Rio out in his pram to our local park, along the river, or just out and about. Come rain or shine, it’s our daily ritual together. 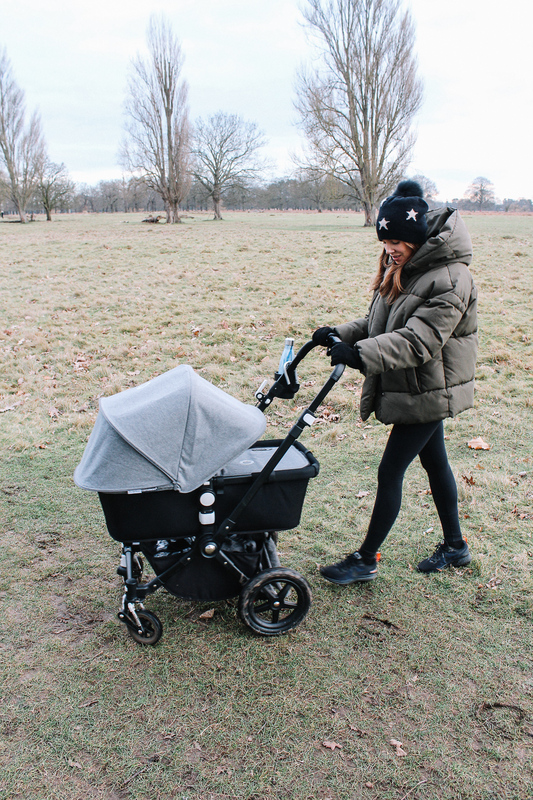 As Rio is currently having three naps a day, I make sure we’re out and about during one of those naps (sometimes two), so I get at least a 2 hour brisk walk – and when I’m in the park without any cars or traffic around, I speed it up and do some power walking. I always wear my workout gear and my comfortable running trainers, to keep me motivated, as well as water and my step tracker (I am currently tracking my steps via an app called StepsApp). My current aim is at least 10,000 steps a day, which I pretty much always achieve, and some days, many times over that. I never used to cherish walking, it was just a simple means to end. Now however it’s my favourite activity; firstly, it’s a free workout, and a great time to get some fresh air, headspace, and some peace and quiet. I had decided a while back that I wasn’t going to commit to any gym, and that I was just going to continue with my daily walks, home yoga and workouts. However, after much deliberation, I eventually decided to sign up to our local leisure centre – which not only has a gym and over 150 classes to choose from – but also amazing swimming facilities for Rio and most importantly, a crèche. I had decided to wait until he was 6 months before I would use it – but seeing as Rio is a pretty big and sturdy boy, I gave it a go, and it went so well! I think it was much harder for me, then it was for him – and being able to pop him in the crèche for just an hour a day, has given me that much needed ‘me time’, and chance to enjoy an hour of working out. I eased into things, by doing various yoga and pilates classes, which are my favourites. Building up strength, lots of stretching, much needed lengthening, core activation and general stamina. As of late, I’ve been adding some spinning classes to the mix, which I used to dread, but I actually kind of loved it this time around! I think it’s because I need that one hour of ‘me time’ to really count. The yoga and pilates are much needed for my body and mind – but the spinning is quick fitness. When that said, one session a week is probably enough, and I’ll definitely make it count when I’m there. Next week I’m going to attempt another favourite class of mine, Body Pump. I swear by this type of class if you want to quickly tone up, and I can’t wait to build up some muscle again. Again, now that I’m a mummy, my priorities have changed. My time is no longer mine only, and Rio is my number one priority. However I am a firm believer in the saying: ‘Happy mummy, happy baby’. 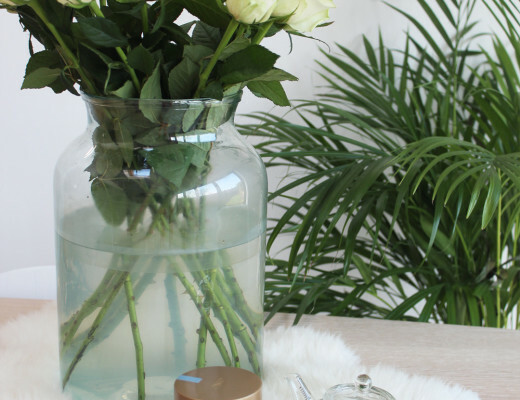 If you are in the position to take some time for yourself on a weekly basis, for just an hour even – it can really make all the difference. I’ve really found that this has made a massive impact on my general mood and well-being. Don’t get me wrong, I love being with Rio all the time, and I was very anxious the first time I left him with Sam, to go to a class, but I felt so good about myself afterwards! Just taking a bit of time for some self-care, has really renewed my energy (even when I’m super tired from broken sleep), and lifted my overall spirit to get going with things! I’m all about routines (more than ever, now that I’m a mummy); I like to know what I am doing week by week, and that’s how I am with my workout schedule as well… I rarely do anything half-way, so now that I’m actually signed up the gym, I have already created a weekly workout schedule, which fits around Rio’s routine of course. My current aim is doing 6 classes a week – with a combination of workouts to focus on relaxing my mind, lengthening my body, improving flexibility, stamina, building strength and improving my general fitness (not asking for much, am I?!). 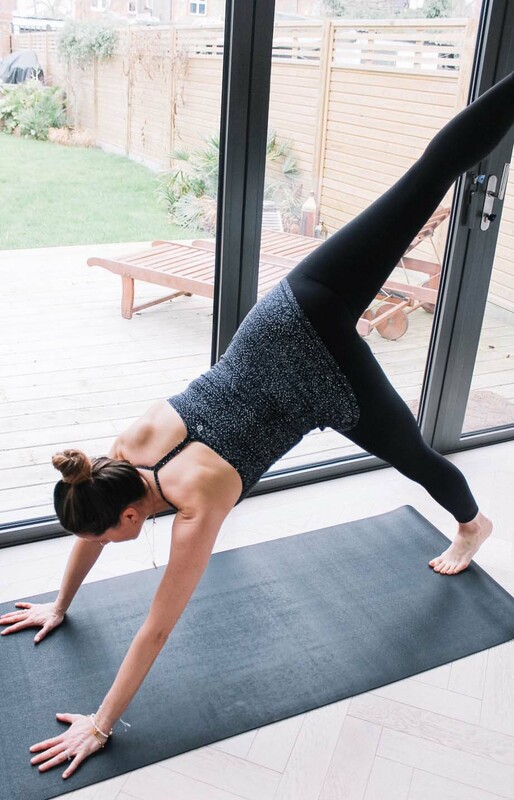 My weekly workout schedule has a mix of everything in it, to hopefully cover all of those areas… This includes 3 different yoga classes – Ashtanga, Vinyasa & Jivamukti (all of my favourites). 1 spinning class, and 1 strength training session (Body Pump or free weights). I’m all about varying up my workouts; I really think it’s super important to keep things exciting and different! Doing a bit of everything, to target all those different areas, and to mix things up for the best possible result. 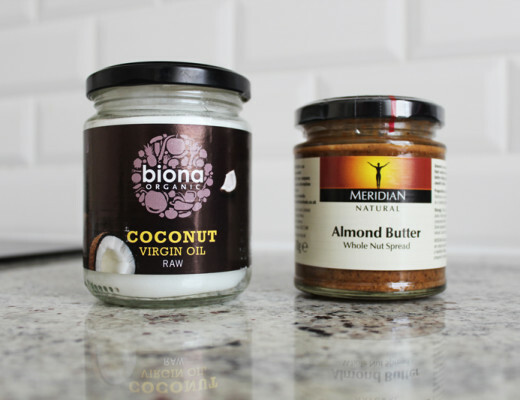 Last but not not least, my diet… Which to be honest with you, is a bit all over the place – as I’m finding myself extremely hungry nearabouts all the time (especially as I’m breastfeeding exclusively). Add in the daily walks and my new gym routine, and I feel like I am constantly eating or snacking on something. When that said, it feels pretty liberating that both during the pregnancy and after, I’m no longer obsessing about my diet! In the very beginning after I had Rio, all I wanted was carbs and quick energy food and drink, to sustain the intense hunger and thirst from both the breastfeeding, and to re-build my body after a pretty intense labour. This continued for quite a while, and I was finding myself having cake and chocolate just about every day (which is something I would never really touch on a weekly basis before). Fortunately, I seemed to be burning off most of it, as the weight kept dropping off (due to the breastfeeding, and keeping active every day). But after a far too indulgent Christmas period (and feeling very sluggish), I decided to kick out some of the bad (and lazy) habits I had acquired, mainly due to lack of time and energy – and started getting back into healthier cooking, prioritising fuelling my body with lots of wholesome goodness, versus low energy/low fat foods. Obviously, everything I eat filters down to Rio, so my main focus has been to eat really good quality, with lots of protein, fibre, good fats and carbohydrates. Last, but not least… Invest in some great workout gear which make you feel amazing, and motivate you to get back into the swing of things! I just recently came across your blog at it has already come to be one of my favorites. Also a scandi living in the UK it’s so inspiring to see how well you’ve done and that everything is possible. One of my greatest concerns moving here has been the family aspects. How do you feel about raising your son in the UK compared to Scandinavia? As self-employed I guess it’s bit different but schools etc. Thank you again for a brilliant blog. That is so kind of you to say, thank you so much, means a lot! Love this post, thanks for the insight!